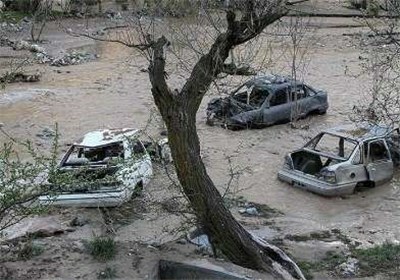 TEHRAN (Tasnim) – Three people have died, 8 have been injured, and 12 are still missing after a Sunday evening flood hit Karaj-Chalus road, north of the Iranian capital, Tehran, an health official announced. According to Arash Rahmati, a medical official in Alborz province, the flood took place on Sunday in Sijan, 19 kilometers into Karaj-Chalus Road, which connects Karaj to northern Iranian province of Mazandaran. 12 ambulances and 1 ambulance bus have been dispatched to the scene, and rescue and relief forces are still active in the area, Rahmati added. Ehsan Nasiri, the managing director of Iran’s Red Crescent Society (IRCS) in Alborz province, also told Tasnim that 12 people are still missing following the Sunday flood in Sijan village. Nasiri announced that 14 rescue vehicles, 5 ambulances, and 2 rescue units, among others, have been dispatched to Sijan so far, and rescue teams are still searching the riverbanks for missing people. Police blocked Karaj-Chalus road in a bid to have the road repaired, Alborz province Traffic Police Chief Colonel Reza Akbari told Tasnim Monday. Also on Sunday severe storms struck the capital city and nearby areas. Photos: Jamkaran Mosque prepares to host 12th Shia Imam’s birth anniv.